Having trouble trying to decide on a unique party theme? We’ve all been there. How about an emoji party!? 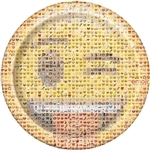 Emoji are super fun and one of the hottest things happening right now in pop culture and the digital world. Plan your themed party with our large and varied selection of emoji birthday party decorations. This theme is perfect for anyone’s birthday, but we bet your kids have been especially hot on the emoji party trend lately. We carry everything you need for your special occasion, from emoji plates and cups to foil balloons, invitations and napkins. In addition to the party essentials, we also have a variety of stickers, banners, decoration kits, tattoos, tote bags, pencils, bracelets, candy containers and other fun accessories for all your party games. If you’re planning on a photo booth, all of these can also serve as great props for it! Show your party attendees what a real party looks like with our emoji party supplies. Shop our collection of smiley face party supplies now to qualify for free shipping!